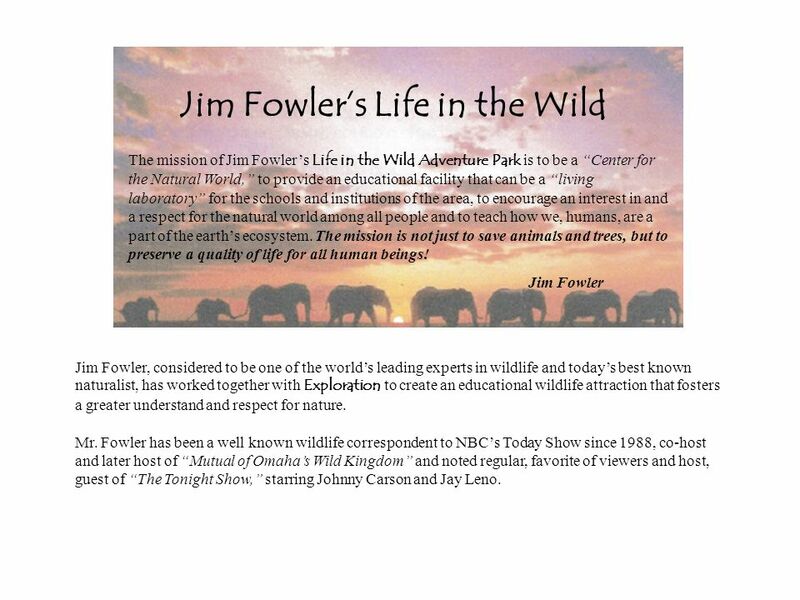 The mission of Jim Fowlers Life in the Wild Adventure Park is to be a Center for the Natural World, to provide an educational facility that can be a living. 2 This singularly unique educational wildlife adventure park is planned to establish new standards for family entertainment and wildlife enthusiasts. The Park will serve as the anchor attraction for the community Exploration. It will be one of the largest safari adventure parks in America. The native and exotic animals will have access to large free roaming and ecologically correct habitats where they will be able to live in a way similar to their way of life in the wild. Life in the Wild will not be a conventional wildlife park or zoo. The animals on display will not come from the wild. Instead, they will have been born in zoos, confiscated, or orphaned. 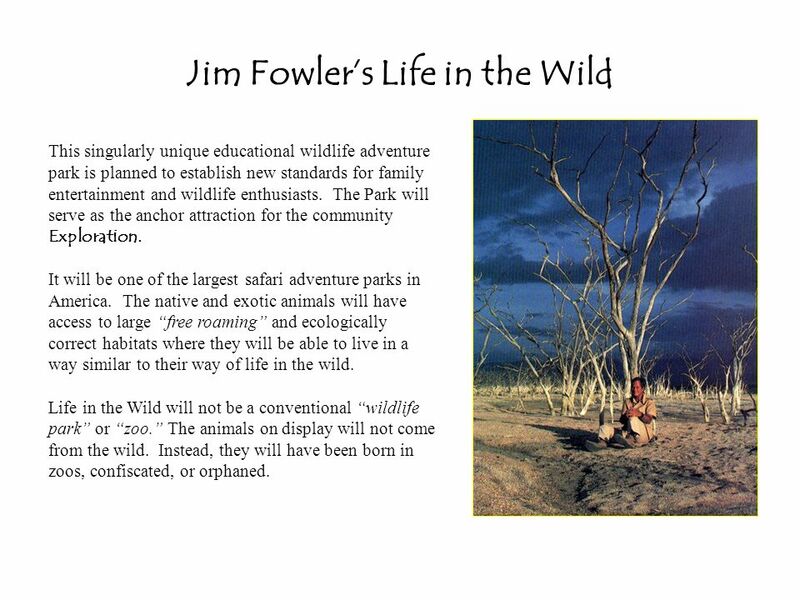 3 Jim Fowlers Vision The Jim Fowlers Life in the Wild Park is holistically planned in Jim Fowlers vision: First, there is a need for a new, more effective approach to nature science education. When existing wildlife programs are judged according to their results, it becomes clear that a better and healthier approach is needed. Second, placing a higher priority on the world of nature is critical for our overall sustainability. Both the world of nature and the world of humans are confined to the same planet and our control is temporary unless we learn to respect and work better with nature. It has become obvious that wildlife, wilderness and open spaces are disappearing at a rapid rate. Animals are being displaced from their habitats, poisoned and poached upon more than ever. If we separate people from animals, there may not be enough people who care. Presenting safe, people- friendly animal ambassadors before the public may serve to focus our attention on the demise of the natural world. 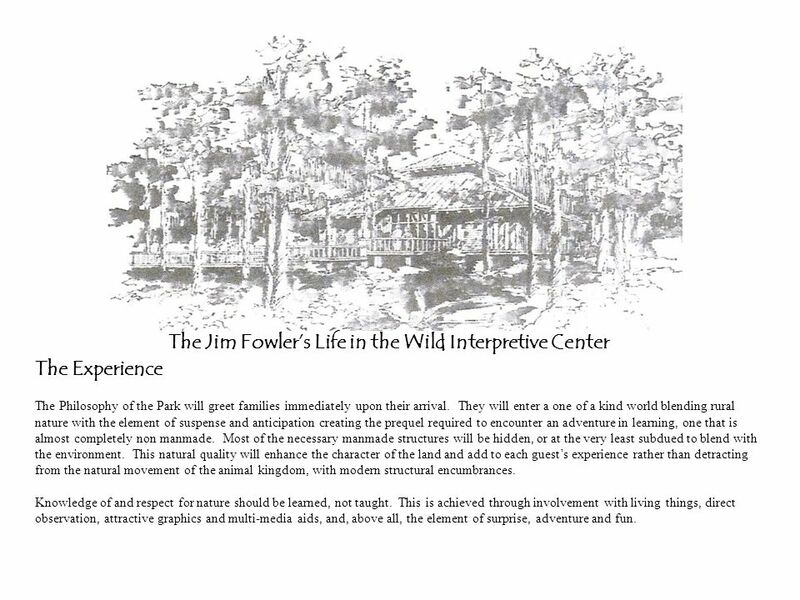 Jim Fowler has predicted that the park will be a wildlife resort for animals and people alike. 4 The Jim Fowlers Life in the Wild Interpretive Center The Experience The Philosophy of the Park will greet families immediately upon their arrival. They will enter a one of a kind world blending rural nature with the element of suspense and anticipation creating the prequel required to encounter an adventure in learning, one that is almost completely non manmade. Most of the necessary manmade structures will be hidden, or at the very least subdued to blend with the environment. This natural quality will enhance the character of the land and add to each guests experience rather than detracting from the natural movement of the animal kingdom, with modern structural encumbrances. Knowledge of and respect for nature should be learned, not taught. This is achieved through involvement with living things, direct observation, attractive graphics and multi-media aids, and, above all, the element of surprise, adventure and fun. 5 The OBJECTIVES, GOALS and DESIGN CRITERIA The objectives, goals and even the design criteria of the park has been carefully crafted from Jim Fowlers lifetime of wildlife engagement, his learning and teaching as well as that of his family and the staff of the Fowler Center for Wildlife Education, In., a non-profit organization which has been entrusted by Mr. Fowler with the responsibility of the park operation. The living laboratory has a primary goal to tell the story of the land and its wildlife in an effective and interesting manner - how they have been compatible in the past and can be in the future. Among the objectives for the park: Design and operate the Interpretive Center as a living classroom that will serve guests as well as residents and students of the Exploration Planet Institute and a variety of educational and research groups. Partnering with other regional schools and universities will allow a comprehensive learning experience to study nature and its fauna. Prioritize programs of animal education and protection – endangered species programs will be instituted. Build a settlement of the early pioneers of the Florida Panhandle (often referred to as crackers) in a portion of the park that will be home to wildlife native to the region. There will be eye level pathways and bikeways throughout the overall Park, as well as a passenger train. Exotic animals of the world will have a continent that represents their co-habitants, surroundings and their country of origin, offering the basic design concept for that portion of the Park. The train stations will also be of indigenous architecture of each particular continent. The fencing and constraint system of the Park that ensures the safety of the community and the animals is designed to blend into the environment. The water bird aviary security fencing, for example, will be built from a patented centenary cable support system. This system is vinyl coated and color blended welded mesh wire is supported in the appropriate areas with no visible supports. Vines will be strategically planted to make the system practically noninvasive. 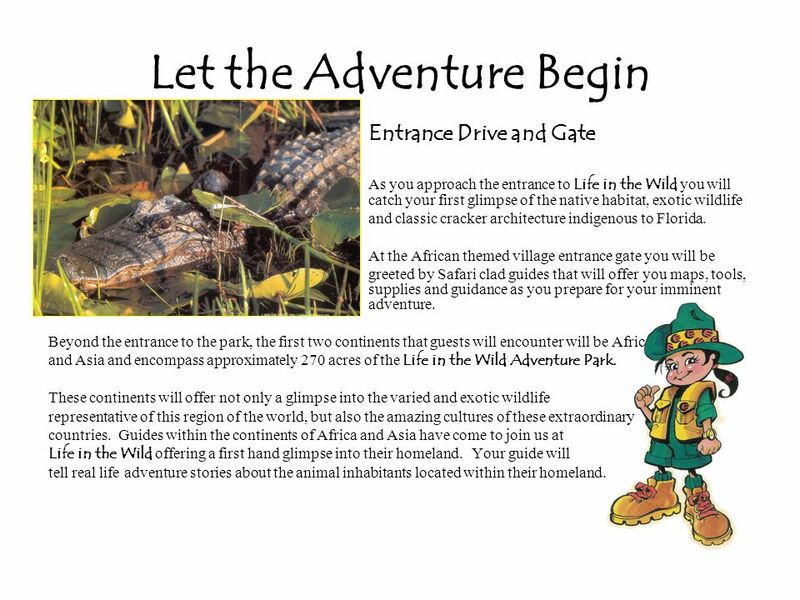 6 Let the Adventure Begin Entrance Drive and Gate As you approach the entrance to Life in the Wild you will catch your first glimpse of the native habitat, exotic wildlife and classic cracker architecture indigenous to Florida. At the African themed village entrance gate you will be greeted by Safari clad guides that will offer you maps, tools, supplies and guidance as you prepare for your imminent adventure. 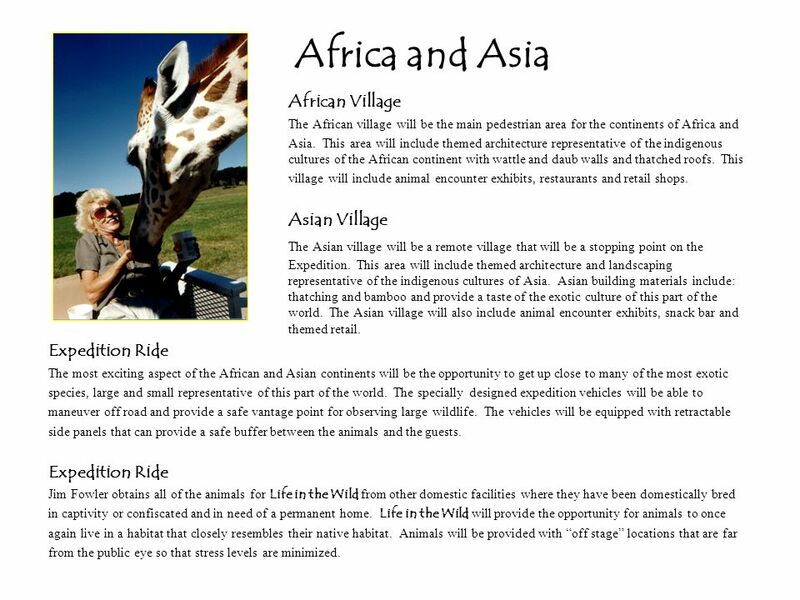 Beyond the entrance to the park, the first two continents that guests will encounter will be Africa and Asia and encompass approximately 270 acres of the Life in the Wild Adventure Park. These continents will offer not only a glimpse into the varied and exotic wildlife representative of this region of the world, but also the amazing cultures of these extraordinary countries. Guides within the continents of Africa and Asia have come to join us at Life in the Wild offering a first hand glimpse into their homeland. Your guide will tell real life adventure stories about the animal inhabitants located within their homeland. 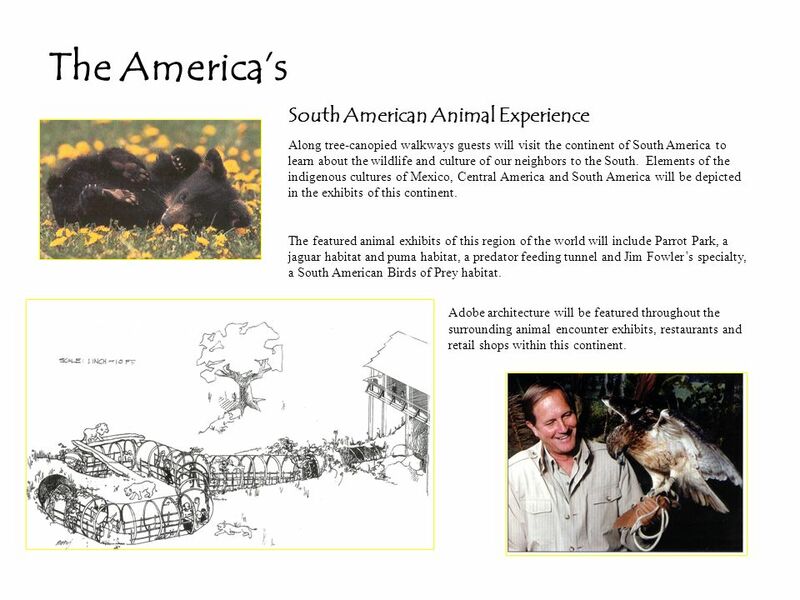 8 The Americas South American Animal Experience Along tree-canopied walkways guests will visit the continent of South America to learn about the wildlife and culture of our neighbors to the South. Elements of the indigenous cultures of Mexico, Central America and South America will be depicted in the exhibits of this continent. The featured animal exhibits of this region of the world will include Parrot Park, a jaguar habitat and puma habitat, a predator feeding tunnel and Jim Fowlers specialty, a South American Birds of Prey habitat. Adobe architecture will be featured throughout the surrounding animal encounter exhibits, restaurants and retail shops within this continent. 9 Wildlife Exhibition Ride Guests can choose to view animals by taking a guided tour through the actual animal habitats. Each guide will provide the history of the species, its current status and the challenges for humans to protect the animal in its natural world. The specially designed expedition vehicles will be completely secured when in predatory animal enclosures. In keeping with Jim Fowlers vision, guests will have an up-close, eye level view of the animals whenever possible. 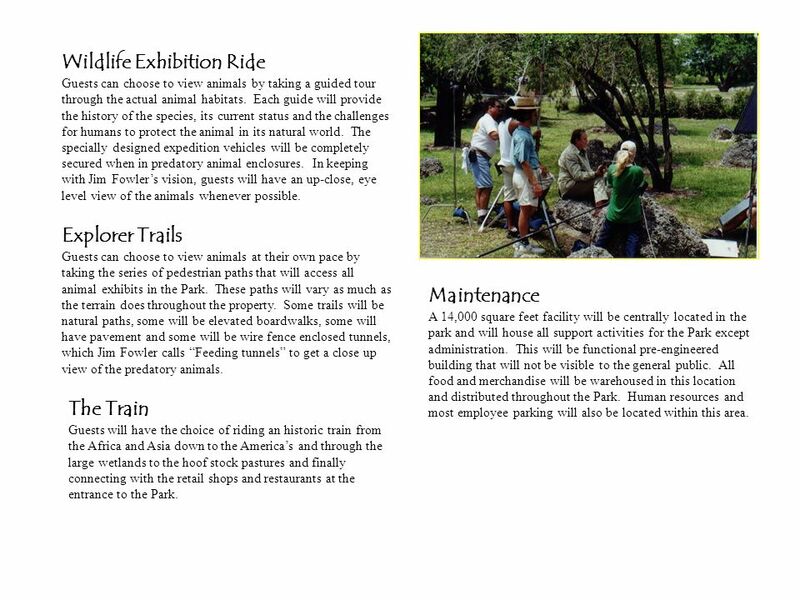 Explorer Trails Guests can choose to view animals at their own pace by taking the series of pedestrian paths that will access all animal exhibits in the Park. These paths will vary as much as the terrain does throughout the property. Some trails will be natural paths, some will be elevated boardwalks, some will have pavement and some will be wire fence enclosed tunnels, which Jim Fowler calls Feeding tunnels to get a close up view of the predatory animals. The Train Guests will have the choice of riding an historic train from the Africa and Asia down to the Americas and through the large wetlands to the hoof stock pastures and finally connecting with the retail shops and restaurants at the entrance to the Park. Maintenance A 14,000 square feet facility will be centrally located in the park and will house all support activities for the Park except administration. This will be functional pre-engineered building that will not be visible to the general public. All food and merchandise will be warehoused in this location and distributed throughout the Park. Human resources and most employee parking will also be located within this area. 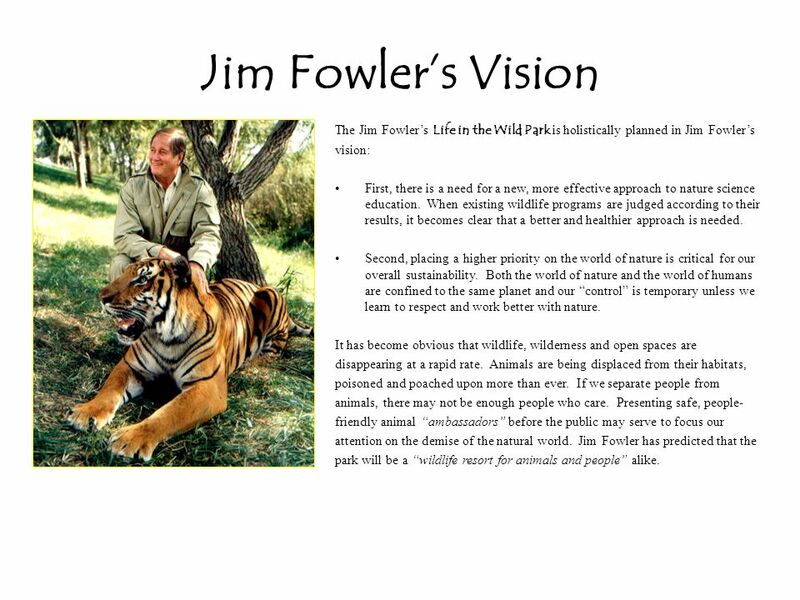 Download ppt "The mission of Jim Fowlers Life in the Wild Adventure Park is to be a Center for the Natural World, to provide an educational facility that can be a living." City of Tybee Island 2007 Master Plan Summary Report Area Character Maps and Area Development Recommendations. When dreaming up our plans for successful 2010 media accommodation, we knew that we had to do what no one else could South Africa : Its More Than. SPRINGS PRESERVE Inspire communities to sustain our land and embrace our culture. The Liberty District Workshop Sacred Cowshands off! Significant historic structures Mildred Terry Library The Liberty Theater Places of Worship Ma Rainey. LEGG PARK DOG PARK PROJECT DESIGN Prepared for: Meridian Township Parks Commission Board August 9, 2011. Hazel Grove Car Park Proposals Overview Transport for Greater Manchester (TfGM) is developing plans to provide over 100 additional car parking spaces at. EQUESTRIAN SKILLS PARK. Vision Statement The Equestrian Skills Park (official name pending) will be a dynamic and fun venue that will inspire equestrians. Park Ranger “To Go” Take Out Menu Collier County Parks and Recreation is pleased to present this menu of natural history programs that can be delivered. Office of Planning, Coastal Zone Management Program, Rural Policy & Best Practices Project May workshops: what’s important about rural? balance & contrast. Explore Florida Text p. E1-E16 THEMES OF SOCIAL STUDIES HISTORY, ECONOMICS, SCIENCE & TECHNOLOGY, GEOGRAPHY, CULTURE, CITIZENSHIP, GOVERNMENT HOW TO READ. LIGHT RAIL PERMITTING ADVISORY COMMITTEE COMMITTEE MEETING Dec. 3, 2014|3:00PM -5:00PM | ROOM 1E-113. From – A Report of the Connecticut Regional Institute for the 21 st Century by Michael Gallis & Associates, 1999 (known as the “Gallis Report”) Knowledge. Tropical Rainforest By: Tatiana Lambert. My Glossary A biotic Factor A nonliving condition or thing; influences or affects an ecosystem and the organisms. Supporting the Conservation and Appropriate Public Use of Canaan Valley National Wildlife Refuge The Nation’s 500 th Located at: Canaan Valley National. Somerford Keynes Parish Council Neighbourhood Development Plan PARISH PRESENTATION 19 th JANUARY 2015. Tourism attractions planning and development Lecture 2. Appalachian Adventure Trail Hike Hike the Appalachian Trail through Tennessee mountain country. Camp outdoors and live in the wild. Learn about America’s. Ecotourism Virginia State Parks. What is Ecotourism Defining "Ecotourism" a has proven to be a difficult task given all the different players attempting. City of Suwanee 2030 comprehensive plan. TODAY’S AGENDA Process Update Community Agenda Framework “Compass” Review  Images and Questions  Comp Plan.